Welcome to Part 2 of my guide to all things window treatments! Last week, I covered curtains in Part 1; if you missed, head on over here! This week, we’ll be tackling another way to dress your windows - shades and blinds. If you’ve never picked these out for your home before, it can feel overwhelming and intimidating (where do you even start?! ), but don’t worry, I’ll break it down for you. By the end of this post, my goal is for you to feel armed with information to confidently make decisions about what works best for your windows. Some of those decisions come down to personal preference and style, while others are more about practicality (what makes sense for a particular window) and your needs. You’ll understand more of what I mean as we get into it. It’s probably good to start by defining our terms. Blinds are traditionally defined as window coverings that have slats, and can be adjusted or angled to allow different amounts of light to come in, block it out completely, and/or control the level of privacy. They’re typically made out of “hard” materials like wood, composite, or metal. Shades, on the other hand, tend to be one solid piece of material that rolls or folds up on itself to open and close. They tend to be constructed out of “soft” materials like fabric and have a smooth look to them overall. While you can’t fine tune the amount of light like you can with blinds, you can choose shades with different opacities to suit the room and your needs. Some can also be constructed to have both top-down and bottom-up functionality to give you privacy on the bottom half of your windows while still letting light in from the top. Now to make things a little confusing, sometimes folks use the terms blinds and shades interchangeably, which isn’t the most helpful when you’re doing your research to try and understand the differences! Don’t worry too much about the terminology though - focus on what the particular window treatment does, how it works, and if it’s the right style for your home. Now, you may be asking yourself, when would I choose shades or blinds over curtains, or vice versa? My answer? It depends! (I know, I know - SO helpful!) It really comes down to the particular windows in your home and what they can accommodate that will look good, the kind of functionality you need to have, and your own personal preferences. Some people just prefer a more tailored, unfussy look so they generally opt for shades or blinds. Others like the softness that curtains add. The only option that is not ok is to leave your windows naked unless that truly is the best choice for the room! First off, let me say that shades and blinds are more custom by nature than curtains since they need to fit the specific measurements of your windows, but that doesn’t mean you have to have truly custom ones made. There are lots of ready-made, off the shelf options out there that come various widths and lengths to fit different window sizes. If you have odd-sized windows or want them to fit precisely, you’ll likely want to go the custom route. For custom, take a look at Blinds To Go, Smith & Noble, and The Shade Store to start. Those three have a lot of options at a variety of price points to suit different budgets. Many of the retailers I listed above offer some custom options too. The advantage of going with a specialty company is that a lot of them offer in-home or virtual consultations, and will either have options to install them for you or can help you find someone local who can do it. There can be a lot of decisions to make when you go custom, so having a guide who knows the ins and outs can be extremely helpful. You’ll also get exactly what you need and want! Before I answer that question, a key decision is to figure out where you’re going to hang them. For blinds, the answer is almost always to mount them inside the window frame; for shades, it can either be inside or outside the frame. How you decide on “inside mount” vs. “outside mount” depends on the window - I won’t get into all the specifics about that today since this is supposed to be a simple guide(!) to window treatments, but if you have questions about your windows I’m happy to answer them. Shades and blinds come with their own hanging hardware and how you hang them is specific to what you purchased. There’s typically a bracket system that installs on either the window frame itself or the wall. If you’re handy and can operate a drill, you should be able to install them yourselves in most cases; if not, I say hire a professional! I’ve personally installed roman shades, bamboo shades, and roller shades in different places in my house it’s actually pretty simple to do! Shades and blinds are super versatile - you can place them almost anywhere! They work beautifully in spots where you want to filter light differently throughout the day (blinding afternoon light anyone? ), if you prefer a tailored look, if you have pets or kids that tend to mess with hanging drapery, or if you just like to keep things simple. They’re also great in places where curtains aren’t a great option due to window or furniture placement. I’m also a huge fan of layering them with curtains if you can do it. It gives you the best of both worlds - the softness, pattern, and heft of curtains with the added functionality and tailored look of shades or blinds. I know I shared this photo (below) of my guest bedroom last week, but it demonstrates that well, so I’m showing it again! 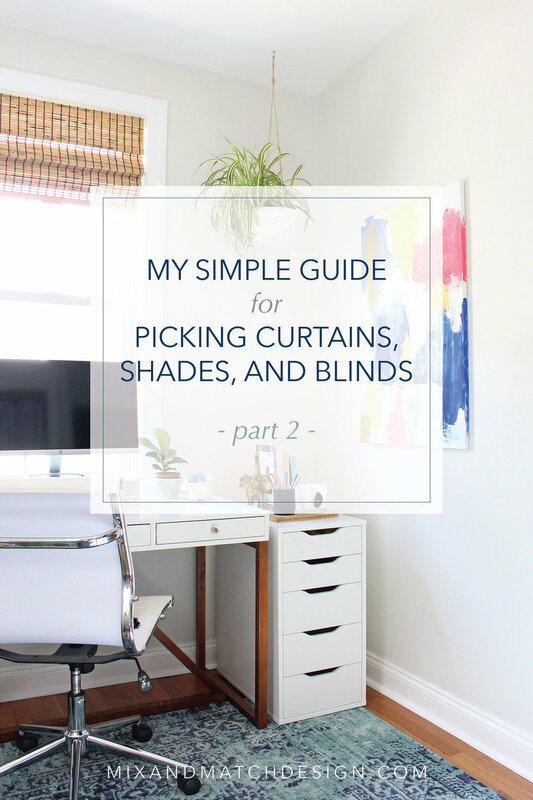 As you get into the selection process for blinds and shades (especially if you go the custom route), you’ll quickly discover that there are a ton of big and little decisions to make. A few that you’ll run into fall under the categories of choosing the particular type of shade/blind, the kind of lift/control, and how much light to filter. Let’s cover those three quickly before we wrap this up! Does it need to block light completely (blackout)? Does it need to be safe for kids? Do you plan to pull it up and down every day or only every now and again? 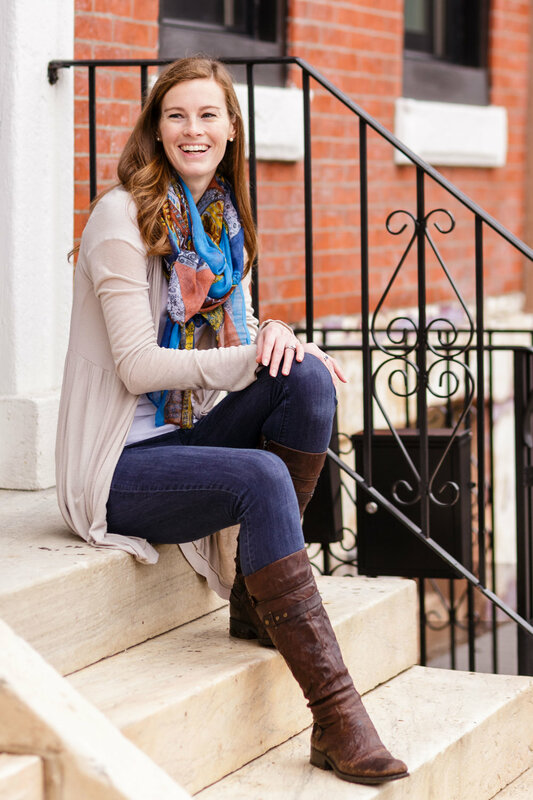 Once you’ve figured out what will work practically for your situation, you can move onto the more fun aspects like materials and style! You’ve got several options for this one including a pull cord, continuous loop chain, cordless, and motorized. Not all of them will be available for every type of shade/blind, but if there’s a particular kind you want, be sure to include that in your search criteria. I’m a big fan of cordless for its clean look and for safety reasons, especially if you have kids, but not all cordless options are created equal. Make sure you understand how the cordless mechanism works and read reviews about how well it works when you can. If you’re not going to be pulling it up and down all the time, this matters less, but it’s still important. The one kind of cordless option I’d avoid is one that goes up and down with magnets (you’ll find those as an option with roman shades) - they’re just plain annoying to use and don’t tend to look as nice. This is totally dependent on the room, your needs, and your personal preferences. With blinds, you don’t really have have to choose since the slats give you a ton of flexibility, but you will have to make that decision if you’re going with shades. Unlined shades tend to be fairly sheer and will offer some privacy, and lined shades can range from light-filtering to total blackout. Think about what your room needs - are you trying to maximize natural light or completely block it out? - and let that be your guide. 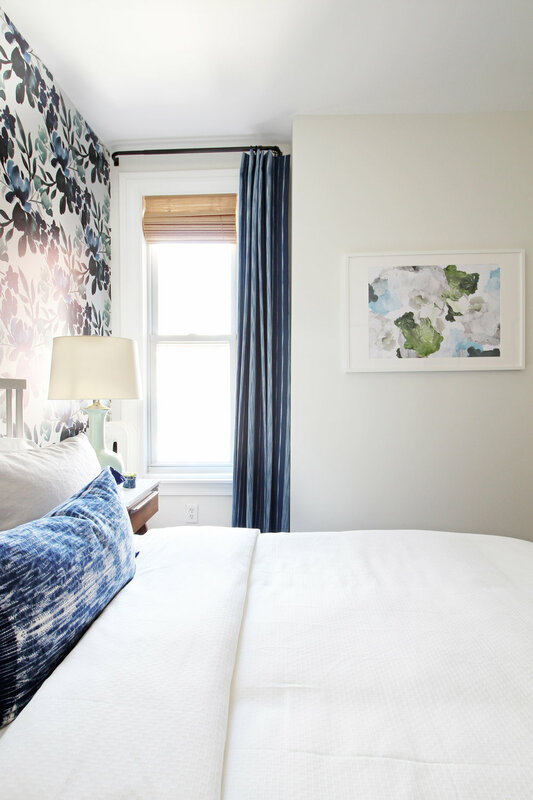 That wraps up part two of this window treatment guide! Want to go back to Part 1 and learn all about curtains? Head on over here! Again, I know we covered a lot of information here, but I hope it’s been helpful and that you feel like you can go out and shop for those blinds and shades with armed with knowledge and confidence! If you have any questions, ask away and I’ll do my best to answer them! Hit me up in the comments or over on Instagram! *This post contains affiliate links, which means Mix & Match Design Company earns a small commission from your purchase at no cost to you.